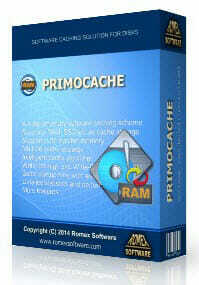 Romex has generously offered three licenses to our DCT readers for a chance to win a copy of PrimoCache. This giveaway contest begins today and will last through November 8, 2018. These licenses are currently valued at $29.95 (US). I have been using PrimoCache for several months and can categorically state that there is a tangible difference in system responsiveness when PrimoCache is installed and running. 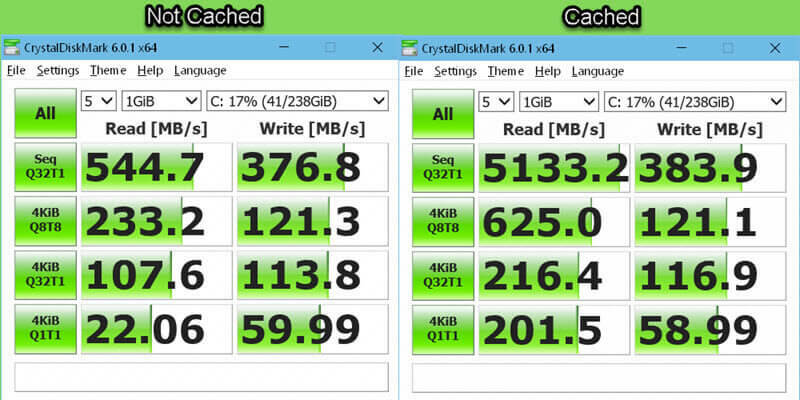 The differences between a RAM Drive and a RAM Cache are vast. I have written several articles about RAM Drives in the past. If you have computer memory (RAM) to spare, then it is being wasted and there is no better use for it than a RAM Drive. Except, of course, a RAM Cache. I won’t go into the details here, but the basic difference between the two is that a RAM Drive is dumb, whereas, a RAM Cache is smart. A RAM Drive lets you store files and data in RAM, which is much faster to access than a hard drive, or even a Solid State Drive (SSD). It will only store what you put into it, and not what you should be putting there. That makes it dumb. A RAM Cache will store files and data in RAM, too, but it does so in a way that mimics your usage patterns. The more often you access something, the more likely it will be stored in RAM. That makes it smart. As you can see in the above image, the Read differences are staggering. The differences with the Writes, not so much. That may be due to the fact that I don’t have “Deferred Writes” enabled. I don’t own an Uninterruptable Power Supply (USP) and don’t want to take the chance of data corruption should the power drop out. I live on the tail end of a rural network and you never know what might happen out here. The above image shows the PrimoCache Main Screen. This is where you create tasks, add/remove target drives, and manage your settings. It can be a small learning curve, but the results are well worth it. If you will look at the indicated Cache Hit Rate in the above image, you will see that it is at around 98%. That means that 98% of the time the requested data is being called from RAM, and not a much slower drive. PrimoCache can be a complicated program to understand at times. The interface is as easy as a walk in the park, but knowing what the best settings are for your particular usage scenario can be puzzling. One of the truly beautiful aspects of this utility is that you don’t have to reboot your computer after making changes to the settings. Make some changes, click a few buttons, and you’re good to go. What a God-send that is! Fortunately, Romex has put together several online help pages to get you going and to explain all this new jargon to you. I’ve been playing around with different settings over the past weeks, and the settings shown in the above image seem to work for me. Your system and preferences will probably be very different. I have all my browser caches, and the Windows System cache and the User’s cache moved over to a regular old hard drive (a “spinner”). I do this mainly because I don’t want all those thousands of Writes hitting the SSD all the time. Normally, moving these particular caches to a hard drive would be just a little bit stupid. But with PrimoCache running, most of that activity takes place in the very fast RAM installed in the computer. Web pages now load out of RAM instead of having to be read off a slow hard drive (even an SSD doesn’t hold a candle to RAM speeds). With 12GB of RAM assigned to PrimoCache, there is very little data being read from any type of drive on my system. 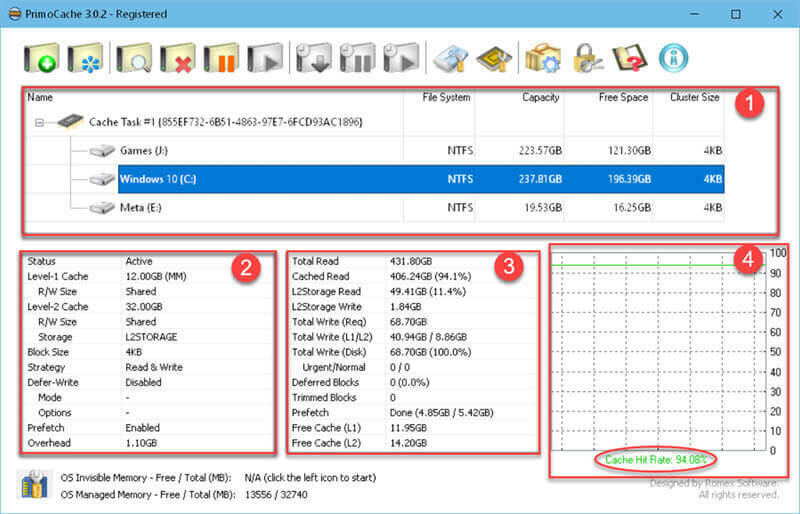 If you have an extra drive laying about, or a spare partition on your HDD/SSD, you can use it as a secondary cache (L2). PrimoCache will use this to store the memory cache (L1) so it isn’t lost between re-boots. Unlike the Windows File caching system, this makes the PrimoCache system non-volatile, meaning you can have it load up at boot-time right where you left off. It won’t have to re-learn your usage patterns. Romex provides a very generous 60-day trial period for this software. You can check it out at this Romex Download Page. We’d appreciate it if you’d take a moment and submit a comment telling us why you’d like to win PrimoCache. However, submitting a comment is not required to enter this contest and will have no bearing on your chances. For your chance to win, simply enter your name and valid eMail address in the spaces provided below, then click Enter Contest. After your entry is accepted you will be presented with options to share the contest on Twitter and/or Facebook. For each person who enters the contest as a result of your share you will earn two (2) extra entries! I wonder how this would compare to creating a RAM disk and putting the paging file on it. The Page file does not contain the same information as a cache and doesn’t serve the same purpose, so that wouldn’t work. The two don’t complement each other.